"Dom Carlos" Paradise Seaview Villa, with Sunrise & Sunsets Everyday! FANTASTIC VILLA WITH 4 BEDROOM, 2 BATHROOM SLEEPS 8 + 1 WITH A FANTASTIC VIEW! This fantastic 60 year old traditional property called " Dom Carlos Paradise Seaview Villa " recently modernised inside and outside offers the holiday makers an ultimate fantastic place to relax, where you can enjoy the sun on the villa from sunrise to sunset. Dom Carlos Villa have a fantastic sea and coastal views that stretch for miles. 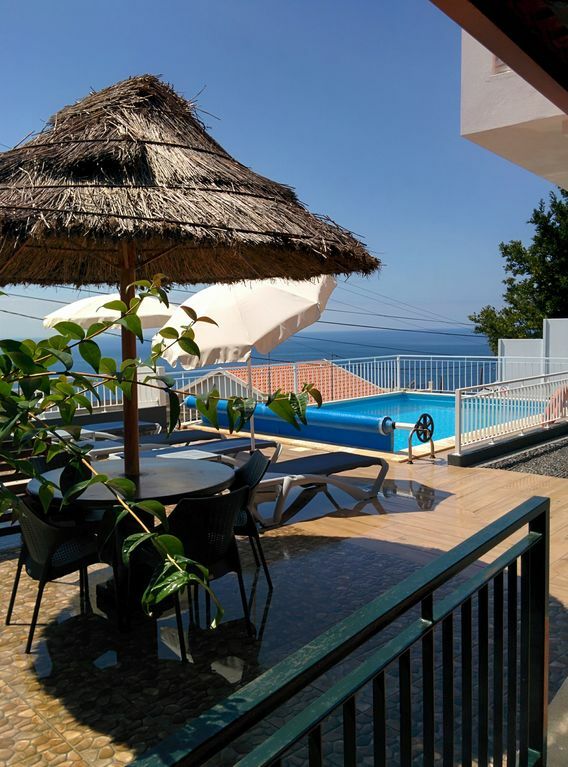 This villa is located in Ponto Do Sol on the south side of Madeira that is the warmest area to enjoy the warm sunshine all year and also on a very quiet road but only a few minutes from the Ponta do Sol Village, sea front. Paradise Villa offers 4 bedrooms, 2 bathrooms, 2 kitchens, 2 dining areas, 2 lounges. There is a very large patio area on the back of the property that also has a sunroom to chill out and for those who want a little excercise there is a treadmill and massage machine. In front there is a swimming pool, also barbecue with table and chair for dining out, with a fantastic View, sunrise every morning and sunset in the evening from your own terrace. Book and be welcome by me (owner of the villa) will give you all information and advise of places to visit on our beautiful island. Ponto Do Sol is a quiet upmarket little village where you can find all that you need from restaurants, supermarkets, beaches, levada walks, shopping centers within a few minutes drive. We are very well situated only 10 minutes away from Ribeira Brava 20 minutes from Funchal also at around 10 minutes away from the famous sandy beach of Calheta. - Praias ( Lugar de Baixo, Ponta do Sol, Madalena do Mar e Anjos). - Cafés e snack-Bares na Ponta do Sol.